Constructed in 1987. for the purposes of Universiade (an international sports competition amongst universities) it was and still is one of the most tallest structures in Croatia, currently being the fourth tallest building in the country. It’s height is 92 meters, 105 if you count the radio antenna atop of it (but we don’t). 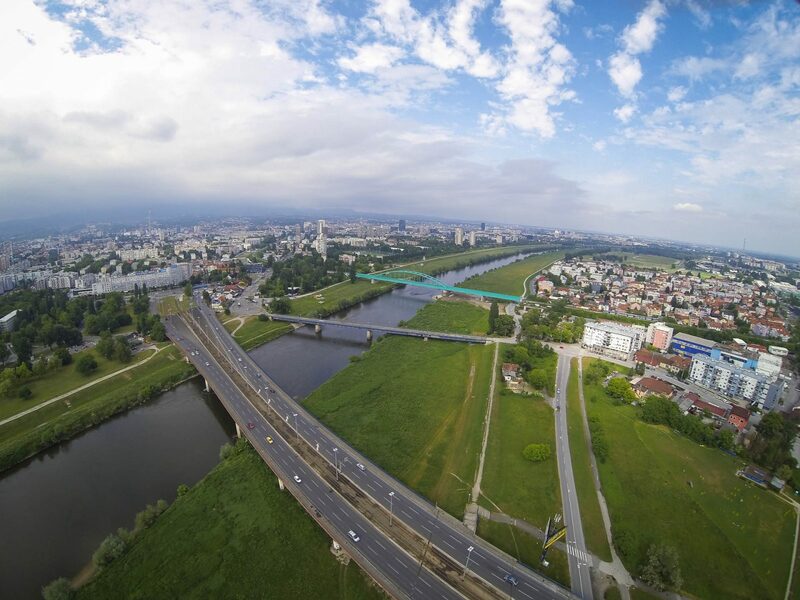 It shares it’s name with Zagreb’s most famous basketball club where Drazen Petrovic played. The building is cylindrical, 25 meters in diameter and holds 25 floors above ground. The facade is derived in dark steel, reflective glass and granite. The rim of the tower is held by the 26 reinforced concrete pylons which makes it resistant to a 7° Richter scale earthquake or an impact of a smaller airplane. 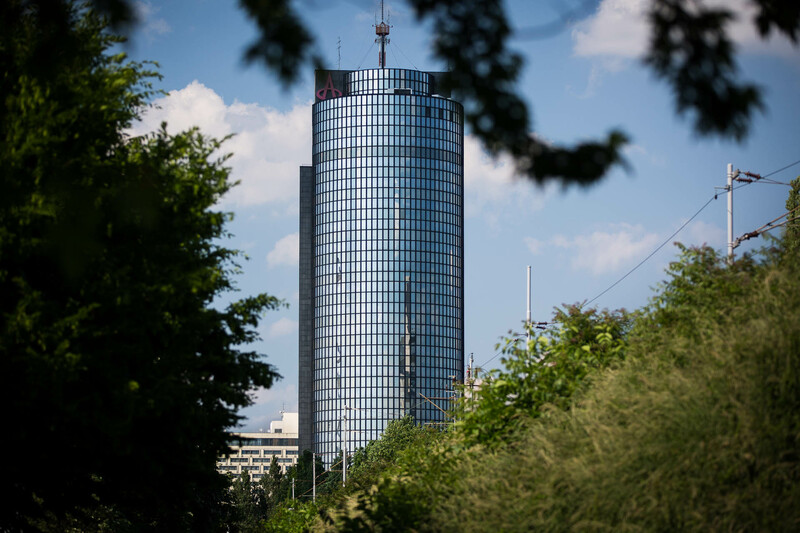 The office tower was built in 1976 by architects Slavko Jelinek and Berislav Vinković based on the famous Thyssenhaus building in Dusseldorf. It’s 94,6 meters tall with 27 floors above ground divided into three sections of varying heights. It is also a part of a larger complex consisting of a smaller business center, art gallery and a fountain. The facade was constructed out of white marble, chunks of which started falling off a few years after the construction making the employees use a tunnel while going to work. It was, however, renovated at the turn of the century. The building also holds the biggest annual staircase race in Croatia called Zagrepcanka 512, the number signifying how much stair competitors have to walk to get to the top. 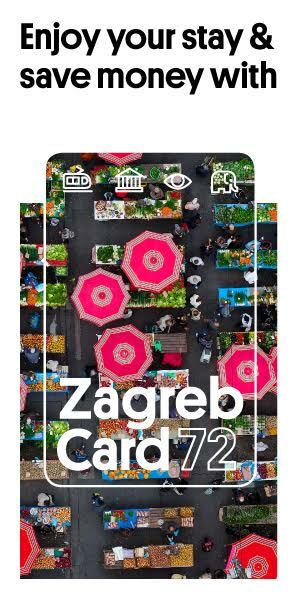 Zagrepcanka is situated on the corner of Grada Vukovara street and Savska street. Newest skyscraper on the list has managed to take the third place from Zagrepcanka by just one meter. 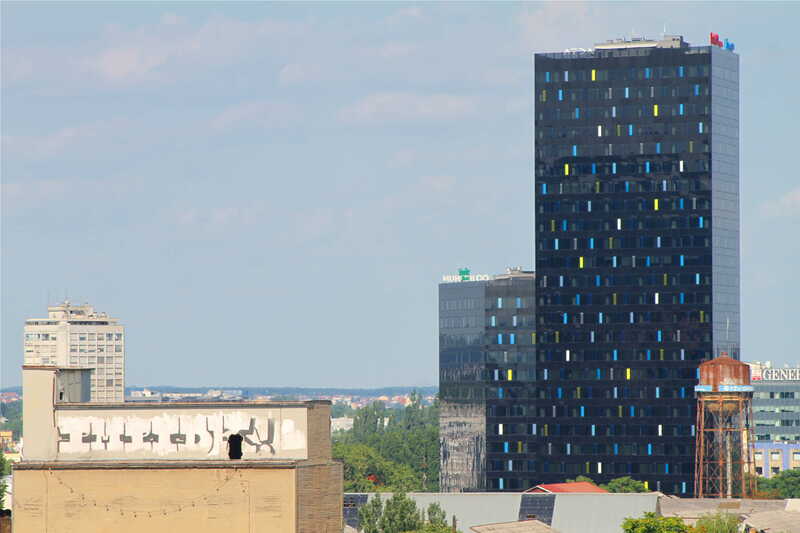 The center was opened this year and contains six buildings: two with apartments and four with offices, but the one we’re interested in is called Zgrada B (Building B) within the complex. It reaches the sky with it’s 96,15 meters of height, standing tall above Autobusni kolodvor (central city bus station). Before the complex was build, there stood a meadow with old dilapidated housings that became Zagreb’s first squat in 1980′. The entire complex is constructed from black non-reflective glass and colored tiles with seemingly random placement and is illuminated during the night. 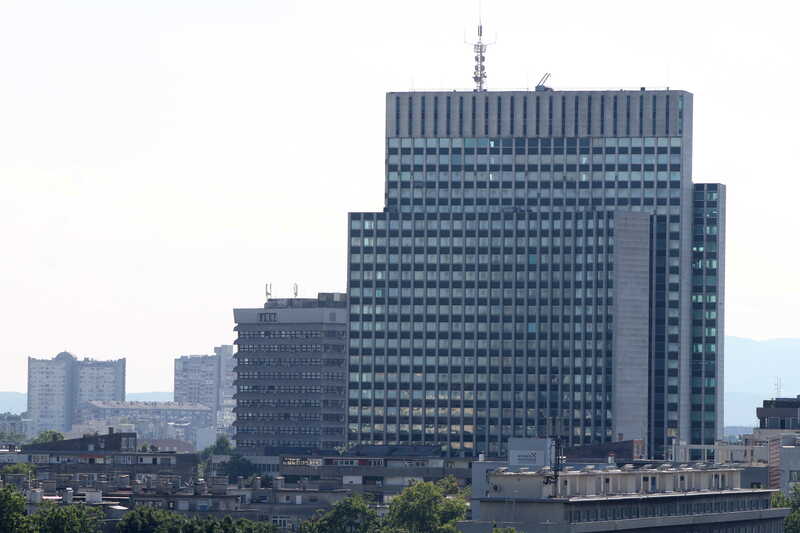 A new home of Zagreb stock exchange was build in 2006. on the intersection of Grada Vukovara and Luciceva streets. Its signed by Marijan Hržić, the architect who made Cibona tower, making him the only one who made it twice on this list. Towering only one meter (it’s 97 meters tall) above Building B in Strojarska, Eurotower is the tallest building in Croatia and is the first skyscraper built for business purposes only in Zagreb having more than 17 300 sqare meters of office space in it. 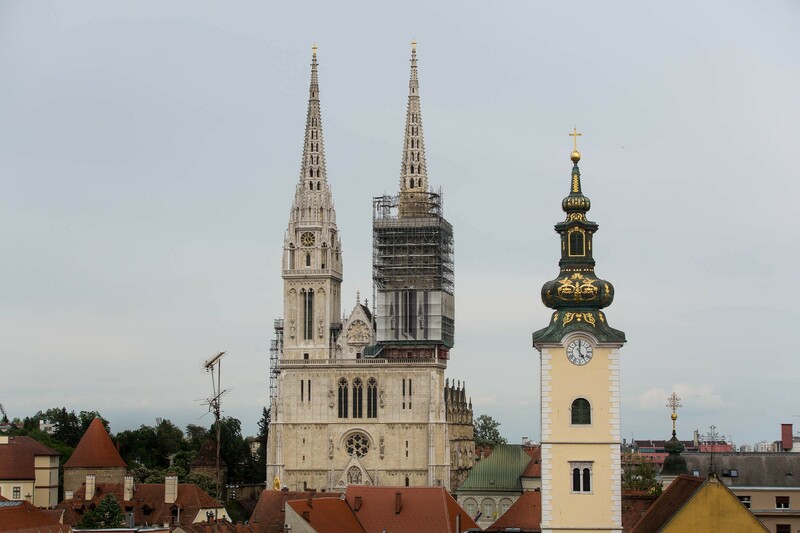 No structure is taller in Croatia than the Cathedral of the Assumption of Mary and kings Saint Stephen and Saint Ladislaus (well, except heat plant chimneys, but nobody counts those). After it was devastated by the Great earthquake of 1880. (the last devastation in a long history of invaders, natural disasters and fire outbrakes that tried to take Her down) reconstructions began and took twenty six years to finish. The cathedral emerged in neogothic style reaching the sky with its two 108 meters tall towers. The cathedral archives hold many of nations biggest historical treasures and is the last resting place for a number of Croatia’s lords, bishops and national heroes, itself being one of the most important and beloved heritages in the country.